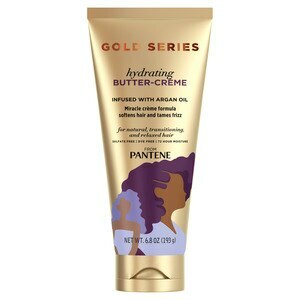 Experience the gold standard in moisture with Pantene Pro-V Gold Series Hydrating Butter-Creme. Thoughtfully developed by Scientists and perfected by Stylists, every tube of our sulfate-free and dye-free Butter-Creme is infused with Argan Oil and melts into wet or dry hair. It provides 72 hours of moisturization and is perfect for both curly and straight hairstyles. Also try Pantene Pro-V Gold Series Moisture Boost Shampoo and Conditioner system from the Gold Series Collection, for optimal hair health. Water, Mineral Oil, Glycerin, Petrolatum, Cetearyl Alcohol, Cyclopentasiloxane, Isodecyloleate, Sorbitan Stearate, Panthenol, Panthenylethylether, Lysine Hcl, Methyl Tyrosinate Hcl, Argania Spinosa Kernel Oil, Histidine, Dicetyl Phosphate, Ceteth-10 Phosphate, Paraffin, Fragrance, Dimethicone, Phenoxyethanol, Decyloleate, Triethanolamine, Peg-100 Stearate, Glyceryl Stearate , Methylparaben, Disodium Edta, Propylparaben. For Natural Textures:, Apply a dime sized amount to palm, rub together to emulsify. Pull through curls to infuse moisture and shine. Apply more as needed to enhance definition., For Relaxed Hair: (Use on dry hair), Apply a dime size amount at night before you wrap hair. Cocktail with Intense Hydrating Oil for even, deeper moisture.